Ferryhill History Society has raided its archives once again to produce a calendar for the new year. 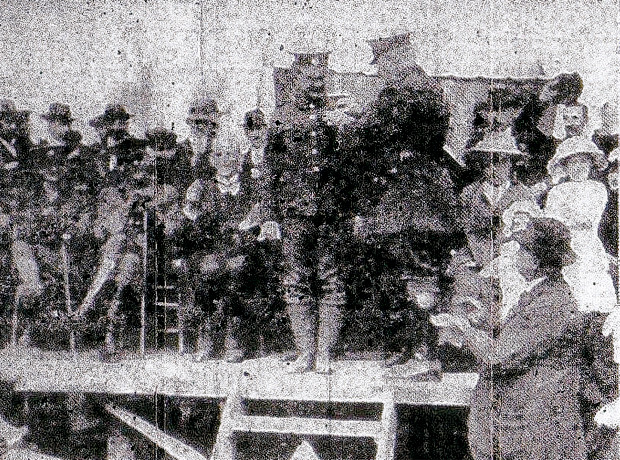 One of its May pin-ups is Lance Corporal Arthur Dixon, who is pictured on a makeshift dais in the Market Place in 1916 being presented with a bravery medal. LANCE Corporal Dixon, who lived at Dean Bank, won the Distinguished Conduct Medal for “conspicuous gallantry at the Battle of Ypres, firstly, in carrying messages under heavy fire, and later, when all the non-commissioned officers in his vicinity had been killed or wounded, in collecting the men near him into a section and controlling their fire with great steadiness”. He was presented with his medal on July 15, 1916, and seems to have won it in Belgium some six months earlier when he was a private in the 8th Battalion, Durham Light Infantry. As well as the medal, he received a congratulatory address and a gold watch. His wife – known only as Mrs Dixon – was presented with a gold bangle. 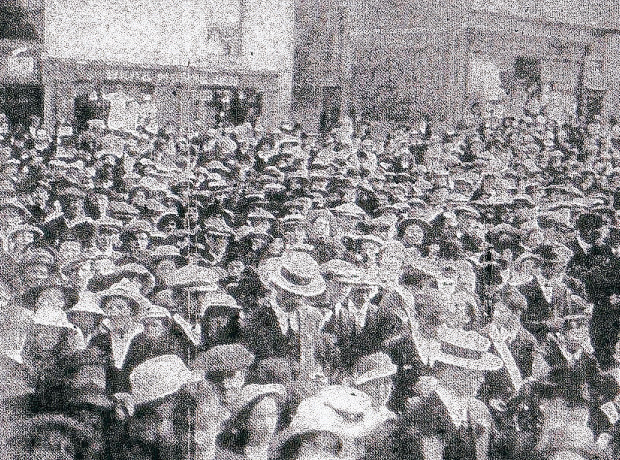 The gold keepsakes were paid for by public subscription, and according to the picture on the front page of the North Star newspaper, hundreds of members of the public gathered in the Market Place to cheer the presentation by Colonel Tress, of Ferryhill. Then Captain JE Rogerson, of Durham City, said a few words. “They had lost many of their best and dearest and would continue to do so, but would beat the enemy in the end,” he said. L-Cpl Dixon appears to have been a miner because the Echo concluded its report of the ceremony by stating that the Durham Miners’ Gala had been abandoned for a second year because of the war. L-Cpl Dixon was one of 21,041 people to be presented with a DCM. In March 1916, about three months after his gallant act, the Military Medal was introduced because so many DCMs were being awarded that it was felt that the DCM was becoming devalued. The MM, therefore, was for acts that were less gallant than the DCM but still deserving of recognition. During the war, 110,342 MMs were awarded. L-Cpl Dixon appears to have made it through the war – are any of his descendants still around?